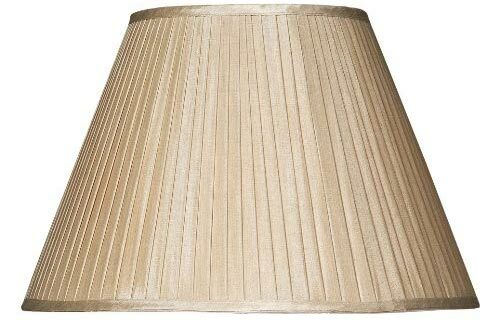 A pleated taupe faux silk 17″ tapered table lamp shade as shown on the Bertha (BER4225) table lamp but suitable for any medium to large sized table lamp. A tapered 43cm empire style lamp shade in pleated taupe fabric with a plain taupe trim top and bottom. Fitted with an E27 shade ring and supplied with a reducer to fit B22 sockets. This shade is not suitable for use as a pendant lamp shade.